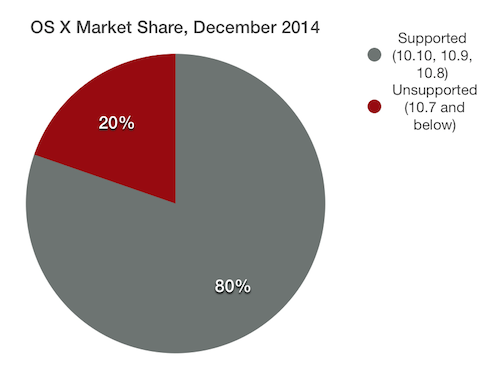 Net Applications recently released its latest statistics about the current operating system market share. As noted by Computerworld, this data indicates that Yosemite (OS X version 10.10, Apple's newest Mac operating system) has quickly jumped up the charts to become the most widely installed version of OS X on Macs in use today, now with nearly 45% of the Mac installed base. This is a significant increase over two months ago, when Yosemite had been out for less than a month, and Net Applications' data indicated that Yosemite had nearly reached 20% of the market already by that time. So what led to the 25% jump? And how does this relate to Mac security? Nearly all of the gain in Yosemite's market share came from former users of Mavericks (OS X version 10.9, which was released a year prior to Yosemite). 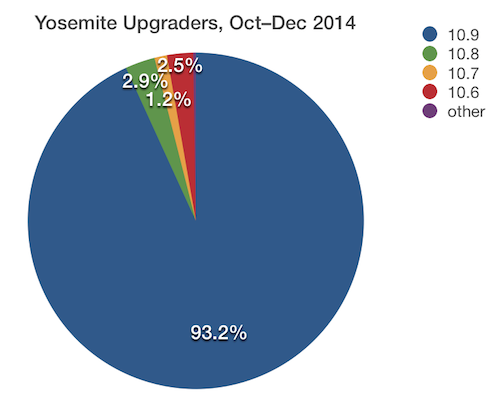 Specifically, more than 93% of those who upgraded to Yosemite within the past two months seem to have upgraded from Mavericks (or started using a new Mac that shipped with Yosemite). Mountain Lion (10.8), Lion (10.7), and Snow Leopard (10.6) only had slight decreases in market share of less than 3% each. 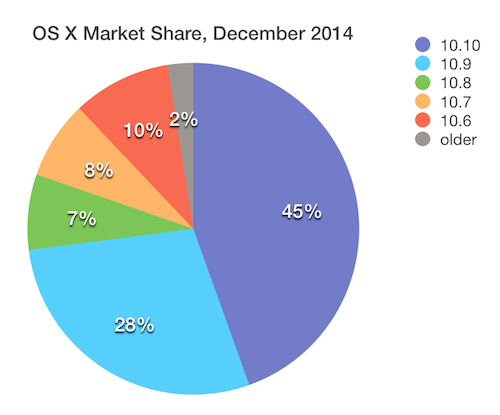 The new market share numbers indicate that a large percentage of Mac users is upgrading to the latest version of OS X. The fact that Mavericks and now Yosemite were offered as free upgrades for all Macs running Mountain Lion—and select Macs running Lion or Snow Leopard—certainly seems to have been a driving force in users' willingness to upgrade their Macs' operating systems. 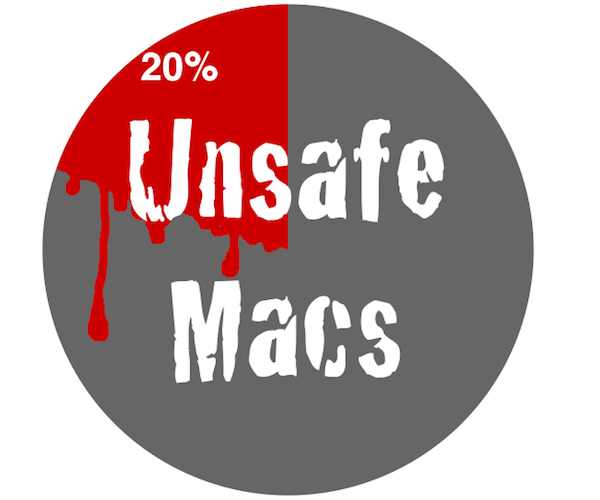 But the latest statistics, just like the stats from two months ago, reveal that approximately one in every five Macs is running a version of OS X for which Apple is no longer releasing security patches. So why are there still almost 10% of Mac users on Snow Leopard, which hasn't been getting security updates from Apple for more than a year? And why is Lion, which is no longer getting security updates as of the release of Yosemite in October, staying nearly stagnant at close to 8% of the Mac installed base? One possible reason is that not all Macs running outdated operating systems are capable of being upgraded to Yosemite due to minimum hardware requirements (see What to Do if Your Mac Can't Run OS X Yosemite). Other possible reasons may include users' concerns about possible software incompatibilities; one well-known example is that Snow Leopard was the last version of OS X that allowed users to run PowerPC-native applications (i.e. software written prior to Apple's transition to Intel processors in 2006). Some commenters here at The Mac Security Blog have indicated that they take an "if-it-ain't-broke-don't-fix-it" approach (in spite of possible security risks), or that their old non-Yosemite-compatble hardware is still working fine so they hadn't given any thought to upgrading. Whatever the reasons for not upgrading, as we've said before, Apple needs to do a better job of explaining to users that their systems are no longer supported. The dialog box says "Get OS X Yosemite Free - New design. Better apps. More ways your Mac works with iOS." The Snow Leopard version of this dialog box has only a "Details" button (intentionally lacking a Cancel, Close, or Not Now button). If this dialog box encourages faster adoption of Yosemite, that's great for Apple, and it's great for end-users' safety. Your version of OS X is outdated and will no longer receive security updates. Protect your Mac by upgrading to OS X Yosemite now, at no cost to you. Perhaps at some point Apple will change the wording of the upgrade prompt to something stronger and clearer. Let's hope it doesn't take a high-profile story about Macs becoming infected before Apple decides to do so. This entry was posted in Apple and tagged Lion, Mac, Market Share, Mavericks, Mountain Lion, Net Applications, OS X, Snow Leopard, statistics, Unsafe Macs, Yosemite. Bookmark the permalink. Get OS X Yosemite Free! I had no idea that there were security issues with older operating systems. I don’t like upgrading unless it is necessary because there are usually problems with any change in the OS. Thank you Intego! i worry my existing apps might not be compatible. Also I suspect Yosemite is just an Apple ploy to get more people enrolled in monthly subscription iCloud accounts. 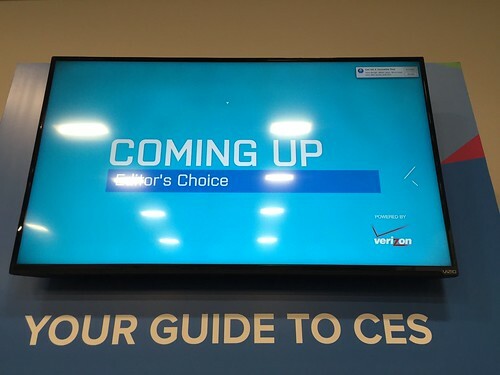 So why upgrade? Mavericks is working fine for me. I don’t have time for trouble. Well, for me, there’s the performance issue. How can I get the same performance with Yosemite on my early-2008 MacBook Pro than I do with Snow Leopard? I don’t want a slower system. How? Compressed memory, App Nap, timer coalescing, Safari’s Fourth-Tier JIT — Yosemite should be noticeably *faster* than Snow Leopard on the same hardware. LOL. Not true at all! Solved my problem: still have that same ol’ early-2008 MacBook Pro, now blazing fast with El Capitan and… a SSD. That makes all the difference. Apple should continue to support 10.6 with security updates. They should do this longer than usual, because of the PPC code issue; LOTS of people are and will continue to run 10.6 systems because the software they rely on every day in their business is not available for newer systems. As the author suggests, it is strongly in Apple’s interests to keep these “ancient” systems secure. I want to update to Yosemite. I’ll never do it on my current Macs. Because, and that’s where I don’t expect hypocritical journalists to acknowledge it, we all know that software updates has always been a well-know plot of Apple to artificially slow down machines to entice people to upgrade their Macs. Truth is, apart from these statistics being false because they only target US users (and the methods of survey are criticizable), actual stats for the world are probably closer to 40-45% of users not using 10.9/10.10. So if Apple stopped screwing customers with these planned obsolescence plots and did cheap paid upgrades that are stable and compatible rather than free and buggy, maybe the “all user updating” utopia would be true. In fact if Apple stopped overpricing (a term that doesn’t even fit so much they crossed the boundaries of reasonable premium price) machines that are too underpowered/configured, maybe people would indeed upgrade. “Whatever the reasons for not upgrading, as we’ve said before, Apple needs to do a better job of explaining to users that their systems are no longer supported.” NO!! Snow Leopard is a cleaner OS then Yosemite, Snow Leopard was a cleaned up version of Leopard and is wonderful for that reason. New is usually NOT better just different, I am of the opinion that anything new or any changes must pass the value test. The changes must be of real value to me. I will NEVER place any of my data on anyones cloud other the one I create, secure and manage! I also could care less about social media and only use Facebook to look at others. I never post, comment or otherwise without a pseudonym and consequently my Facebook accounts are under Pseudonym. Integration with IOS is not very important to me, I use computers not just “Apps” like Browsers. I choose Mac at the time simply because MS OS at the time was rather poor, and the new unibody macbook pro’s had great industrial design; a lighted keyboard is a must! I and many others stay on Snow Leopard because of it’s inherent stability and the FACT that subsequent OS/x releases have been less stabile, while adding features I am NOT interested in! I do not want my Laptop to be a tablet or otherwise, sure they overlap but they are different form factors that are suitable for different tasks. Programming, word processing and complex editing on a tablet are well so tedious (impossible) on a tablet at this time. Anyway, create a NEW Snow Leopard by rolling out a cleaned up OS/x version without silly changes for the sake of change and I may upgrade. If my hardware becomes too old for Apple, I will switch to a non-apple OS or maybe I will get ambitious again and write my own… That will never happen but it could. Freedom is what I like, the rest of you can be lead around. Enjoy your leader. I’m not installing new Yosemite because design is really terrible, colors are so harsh and some text is not readable on this transparent parts. I tried it but it was really bad experience. I will keep using Mavericks until they change this colors and get rid on new transparent surfaces. As a developer, I’d just like to point out that Apple makes it EXTREMELY DIFFICULT to develop applications for older versions of OS X. They generally only include SDKs for the last couple versions of OS X in their IDE, so that if you want to build a legacy version of anything, you are essentially fighting Apple, whose stance is upgrade or die. Instead of upgrading wholesale, you can do what I do and just install new versions of OS X on different hard drive partitions, so that you are able to test things before breaking things. Thank you for continuing to support older versions of OS X in your application development, Beardsly! Anything that nags for a upgrade , I have my suspicions about. I have two macs, one with Mavericks on as my main computer, and Snow Leopard which I use as a media centre and where I can access scanner, DVD and HDD storage and use Skype and watch TV on it while I am working on my main mac. I don’t like Yosemite or El Capitan, because i hate flat design. I don’t get a nag window on Mavericks but I do on the snow leopard machine. I don’t want to upgrade my snow leopard machine, even to Lion or Mountain Lion, because my scanner wont work anymore on it natively and would be forced to install a virtual machine running windows XP to access the scanner. On my main mac , in bootcamp I have windows 7, and hate windows 8 and 10 because I hate flat design.. I hated when I was nagged with a windows 10 update dialogue, which I had totally trashed off my windows 7 bootcamp. How would I remove the El Capitan nag from snow leopard. ? It is annoying when it pop ups when I am chatting, or watching videos/TV on it or busy scanning.